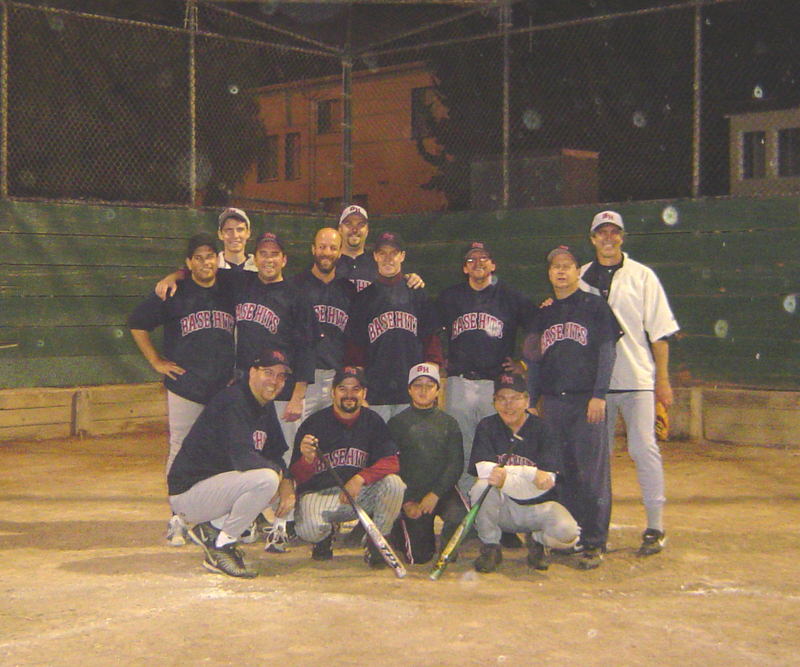 BERKELEY, CA 10/4/04 – The Basehits continued their 20 year anniversary run (1984-04)with a return to the post season for a second time, looking to avenge their only loss of the summer campaign, a forfeit to the Dirt Bags after three players were DQ’d for softballs over the Grove netting. Although it was a hair raising, nail biting affair, the Hits were able to counter a mighty comeback and pop the Bags in the end by a score of 18-17. The first inning began with a sharp Bob “I Have Extra Caps” Nelson on the mound who proceeded to set the D. Bags down quickly. Bobby “Sledgehammer” Ortiz (2/3, RBI, HR) got the Hits started in the bottom of the inning with a four pitch walk, Brian “Opposite Field” Murray (3/4, RBI) surprised all by ripping a single to the left of second base, then Danny “Another One on the Way” Lashkoff (4/4, 3RBI, HR) lined a single to center, and the Hits were on the board. Cleanup hitter Rich “I Don’t Do Grove” Stayman (SF, 2RBI) forced Murray at third, but Robo “Hits ‘R Us” Sullivan (3/4, 2RBI) clobbered a shot to the deepest part of left center, plating a second run, unfortunately hitting a tree well over the fence that was ruled a ground rule double. With runners at second and third, Loren “Backstop” Carjulia (1/3, 3RBI) put bat to ball for a sacrifice fly scoring Stayman, Dave “Keep It In The Park” Johnson (1/4, RBI) then was robbed on a shot deep in the hole at short and the Hits closed the first inning with a three run lead. Nelson continued to bring it in the second, again shutting down the Dirts. Doug “E Fresh” Moss (4/4, 3RBI, 2HR) led off the bottom of the inning with a solo shot into the left field net, Sean “The Green Monster” Haughey (3/4, RBI) popped out to second, Nelson (2/4) singled but was forced out at second on a grounder by Matt “I’ll Play Anywhere” Titlebaum. Ortiz ended the inning with a strikeout and the 4-0 lead, however, was short-lived as the Bags of Dirt scored six times in the top of the third. Lashkoff led off the bottom of the inning with an inside-the-parker to bring the Hits within one after three. The fourth inning saw no scoring from either team, and the Dit Bargs managed a run in their half of the fifth. With one out and trailing 7-5, Murray made the move to send up designated hitter Ed “Art History 101″ Dennison (1/2, GWRBI) who promptly drew a walk. Nine batters later, the Hits were in the driver’s seat, having scored eight more runs, including an opposite field double by Carjulia and a protested triple by Haughey. The sixth inning saw the Baggies score two and the Hits follow with three of their own, including a solo shot by Ortiz. So the Hits brought a seven run lead into the seventh and final inning, and, with the bitter taste of a ten run seventh inning in the Spring by the Ozzies still fresh in their mouths, it was d√©j√ vu all over again this time as the Dirt Sacks were able to put up an eight spot to take a one run lead in the top of the seventh inning. The inning might have been bigger were it not for earlier solo home runs into the net which exhausted the Dirt B’s three home run limit. This time, however, the Hits came. With one out on another robbery of Johnson by the Drit Bags shortstop, Moss followed with a high and deep shot to left which looked like it might clear the net for an out, but the cool autumn air kept the ball from going out and as it settled into the net, the Hits’ third home run of the evening tied the contest. Haughey lined a single to right and Nelson stroked a liner to right center for a double, leaving the potential winning run at third base. With one out and first base open and lead-off hitter Ortiz on deck, the Dirtees chose to pitch to rookie wonderkind Dennison, who nailed a 1-0 pitch over the drawn in outfield for the come from ahead victory. With two home runs on a 4 for 4 night, Moss was named the game’s MVP, with honorary mentions to Lashkoff (4/4), Sullivan (3/4), Haughey (3/4) and the entire infield for an errorless night. The Dewers Scotch Whiskey Player of the Game Award was resurrected for the occasion and was presented to Sullivan for the longest throw ever over the third base backstop in Grove history. A second Dewers award for the season was given to DJ for getting thrown out of three games, who solemnly commented “Now I know how Rich feels.” After posing for a team picture, the celebration continued into the wee hours at The Albatross, where, in the most stunning development of the season and perhaps the entire Basehit chronicles, all players paid their reg fees before next season, which thankfully is at San Pablo Field No. 1. The Hits outscored opponents 193-72 for the season, 58-4 in the 1st inning. Went ahead for good in the 1st inning 7 times; Twice went ahead for good in the 2nd. Scored more runs in one inning than the other team scored all game 8 times. Only two innings all year entered the field to play defense when trailing, both times in the championship game.